The Complete Zoo Adventure: Funnest Kids Creation Science Book Ever! 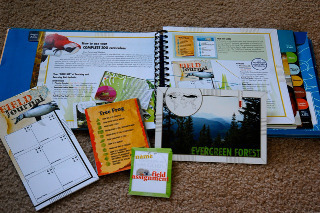 I was so impressed when I received The Complete Zoo Adventure in the mail; my kids and I love it! It's hard cover, can be used with kids from Kindergarten through middle school, and includes numerous reproducible activity sheets for younger ages, intermediate, and advanced. My kiddos had so much fun learning about the bible (lots of great bible verses are featured), mammals, paws & claws, and so much more and had a great time doing the dot-to-dots and writing activities that came with the book. There are also 27 Field Fact Cards about animals featured in the book, 3 little Field Journals, and 12 name badges for when you go on a fun real-life zoo trip. If you click here, you can use Amazon's "Look Inside" feature to see some of the beautiful pictures yourself. I was all the more impressed when I realized this book is an affiliate of the Creation Museum in Kentucky. If you're ever that way, be sure and check it out. We've been twice and only wished we'd had more time to spend!